Wayne Huizenga is a man of distinction. He's the only person in history to build three Fortune 1000 companies practically from scratch: Waste Management, Blockbuster Entertainment, and AutoNation. He is the only person to have developed six NYSE-listed companies. He also owned the Miami Dolphins until 2008 and is the previous owner of the Florida Marlins baseball team and the Panthers hockey team, making him the only person ever to own three pro teams in a single market, two of which won national championships. 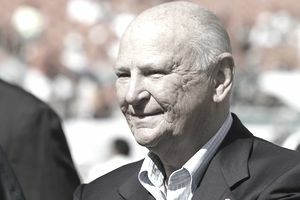 Wayne Huizenga was born in a Chicago suburb in 1937 and moved to Florida in his teens. After his parents divorced, he lived with his mother, driving a truck and pumping gas after school and on weekends to help with expenses. Following a brief sting in the army and college, Wayne Huizenga left school to work with a family friend who owned a garbage collection company. Within two years, he bought his own truck and branched out on his own. It eventually grew into Waste Management Inc.
Wayne Huizenga was legendary for his hard work. When first starting out, he would drive the truck from 2:30 am until noon then spend the rest of the day knocking on doors and introducing himself to drum up new business. The company grew to 40 trucks locally, then merged with another business in Chicago to form Waste Management Inc under Wayne Huizenga's direction. WMI soon went public and used its newfound buying power to acquire nearly 150 local and regional garbage services, making it the largest waste disposal company in the U.S.
From Founding to Finding and Funding. Great entrepreneurs don't just start businesses—and Wayne Huizenga knew this all too well. Sometimes they see the potential in an underdeveloped company and buy it to develop it. It is what he and two partners did in 1987 with Blockbuster. Following a similar model to WMI, Wayne Huizenga took the company public in 1989 and launched into rapid growth -- from a $7 million business with 19 stores to a $4 billion global enterprise with more than 3,700 stores in 11 countries. In 1994, Blockbuster sold to Viacom for $8.4 billion in stock. Following the Blockbuster sale, he created AutoNation, the first nationwide auto dealer in the U.S., now with 370 dealerships, and the first to go public. Next, he created Extended Stay America, which grew to 62 locations in its first year, and nearly 500 hotels by the time it sold in 2004. Wayne Huizenga also re-entered the waste management field with the creation of Republic Services, which grew to be the third-largest waste management company in the U.S. before merging with his first company, WMI. The key to Huizenga's success is a formula that he has proven what works time and time again. He focuses on service industries, mostly that have recurring income: dumpster rental, trash collection, video rental, etc. Even with AutoNation, there's no big manufacturing plant, and the emphasis of the model is on customer service. Most of all, Wayne Huizenga focuses on finding industries that aren't meeting customer needs. Each of his companies has set a new standard of highly professional service in its industry. But Wayne Huizenga is not without his detractors. A 1994 article in the Miami New Times dug up a pile of dirt (both actual and alleged), including an early assault case in which he had roughed up a sales prospect who refused to do business with him (Huizenga lost the civil suit); climbing his way to success at the expense of others; ties with organized crime; physical and emotional abuse of his wife; unfair competition practices; illegal political contributions; and disregard of environmental laws. But regardless of the skeletons in his closet, there's no arguing with Wayne Huizenga's business success. In 1992, he received the Horatio Alger Award, given to honor Americans who have overcome adversity to achieve great success. Wayne Huizenga is also a five-time recipient of Financial World Magazine’s “CEO of the Year.” He was named Ernst & Young's 2004 U.S. Entrepreneur of the Year and 2005 World Entrepreneur of the Year. He's at the top of his game and shows no signs of slowing down any time soon.